During my placement this semester, one of my assessment tasks was to plan, implement, reflect upon and evaluate an intervention for a group of students in my grade one classroom. The aim of the intervention was to assist the student/s to go beyond their current level of knowledge and/or skill. 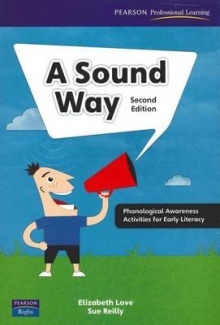 After discussions with my mentor, and also through doing my own pre-assessment I found that two students had particular issues with their phonological awareness. 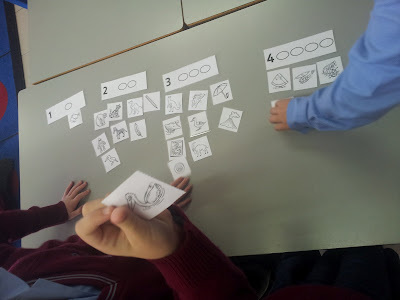 Over a two week period, I conducted a series of tasks for these students during their normal reading groups, moving them from their current level of understanding to the next step on the phonological awareness continuum (ZPD, Vygotsky). A majority of these tasks were obtained from the book seen above, 'A Sound Way' by Elizabeth Love. I cannot emphasis enough about the benefits of using this text. It contains some fantastic hands-on activities to increase students phonological awareness. The activities are playful and engaging, with the grade ones loving the activities. They were always very excited to be working with me, and I am sure it was due to the activities from this text. By the end of the two week period that students had made fantastic progress (I used my assessment to establish this 'for,as and of learning'), with one student moving from a level 8 text to a level 11 and the second student moving from a level 8 to a level 14 text. Both were extremely proud of their achievements and were able to experience success. By the end of this intervention they felt that they were readers, which they didn't at the start. I couldn't have been more proud of them. I will most definitely be purchasing this book in the future :) You can purchase it here if you are interested. Also, there is another edition with an interactive whiteboard CD which looks amazing.